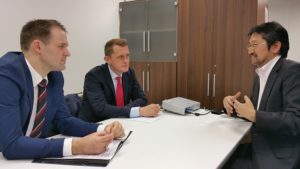 On February 19th, Dr Johannes Winter, head of Programme Area “Technologies” at the National Academy of Science and Engineering (acatech / Germany), and Dr Alexander Werbik, project coordinator of the project “Industrie 4.0 Global” at acatech, visited the head of the Industrial Value Chain Initiative, Prof. Nishioka, at his office in Hosei University, Tokyo. Reason was the interest from German side to understand the perception and status of Industrie 4.0 in Japan first-hand. The findings serve as input to a study covering the world’s leading countries. Taking advantage of the occasion, possibilities of a closer collaboration between Japan and Germany in the area have also been discussed.